“The Chaminade Man does the right thing at the right time because it is the right thing to do, regardless of who is watching.” This is the phrase that embodies what it means to be a Chaminade student. As the Class of 2019 began their high-school journey, they were introduced to the ideaof the “Chaminade Man” and other Chaminade traditions during their 3-C Week which ran from Monday, August 31 to Friday, September 4. 3-C Week is Chaminade’s freshman orientation program designed to expose the newest members of the Chaminade Family to Chaminade High School. The three “C”s are: community, confidence, and commitment. These are the themes of Chaminade High School that are instilled in the freshmen throughout the week so that they can become successful Chaminade Men. Bro. Thomas Cleary ’81 welcomes new freshman to Chaminade High School along with Senior Leader Colin Maloney ’15 (second from right). 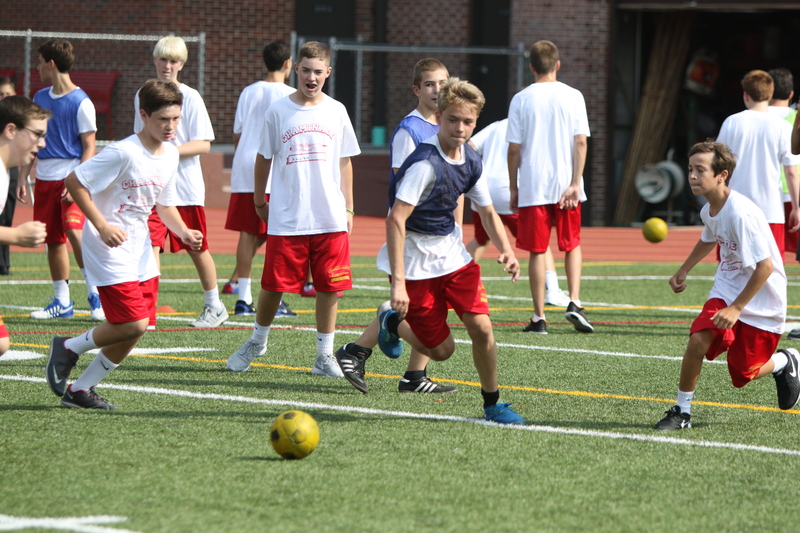 Before the incoming class of freshmen stepped inside the building on their first day, they were given a taste of the strength of the Chaminade community. They were greeted by a welcoming committee of Senior Leaders andfaculty upon their arrival on school grounds. The freshmen were then led through the building to their homerooms dimming any sense of trepidation that they might have felt. There they settled in, met their peers, and began the daunting task of choosing a homeroom name. “I thought it was very professional. It was a good feeling to have current students welcoming us and showing us around, so we did not have to figure everything out on our own,” said Nicholas Whiteman ’19 of homeroom 1M. Mr. Graham Otton ’05 assists new freshman in their use of Canvas, Chaminade’s new Learning Management System on their iPads. Throughout the week, each homeroom took several classes. The classes during 3-C Week included math, study skills, and writing. The freshman also attended special lectures about the three“C”s, discipline, guidance, fitness, and a new course called Digital Citizenship to help the freshmen with the use of their school-issued iPad. In addition to these classes, each homeroom attended special presentations about the Publications Center, which houses Tarmac, Crimson & Gold, and Skylight, E.T.V. which operates the morning announcements, and Stage Techs which controls the lighting and sound during plays and concerts in Darby Auditorium. On an assigned day during the week, each homeroom had the opportunity to visit Chaminade’s beautiful retreat house, Meribah, in Muttontown. The students were given a tour of the retreat house and some of the fifteen-acre property which includes: a pool, courtyard, and most importantly, a path with the Stations of the Cross. The students then ate lunch which was barbequed for them by upperclassmen. “It was a fun experience and I cannot wait to go on a retreat during the year,” said Colin Dunn ’19 of homeroom 1D. Freshman cheer each other on during a friendly soccer match during 3-C Field Events. Undeniably the most fun and intense part of the week were the field events. The 11 freshman homerooms competed against each other in soccer, handball, dodgeball, basketball, volleyball and water polo. This setting encouraged these new classmates to work together, communicate, and trust each other to complete a common goal. The homeroom with the most points at the end of the week earned a trophy for 3-C Field Events. The winner of this year’s competition was homeroom 1M. As the week came to an end, the Class of 2019 gathered at Gold Star Stadium to take a group photo. Freshman divisional coordinator, Mr. Michael Dolce ’99, then spoke to the class about their upcoming experiences as Chaminade Men. After this short assembly, the students received cookies and iced tea and left Chaminade for their Labor Day Weekends now prepared for the new experiences that they will face as they embark on their high school careers.